The 74-year-old Democrat says he was diagnosed with early onset Parkinson's disease 3 1/2 years ago. Ed Rendell, former governor of Pennsylvania, former mayor of Philadelphia and lifelong political force, is battling Parkinson's disease, he said Monday morning. The 74-year-old Democrat announced that he is receiving treatment from Penn Medicine's Dr. Matthew Stern. He was diagnosed 3 1/2 years ago with early onset Parkinson's, Rendell said. Rendell said he had noticed a wobble in his hand and was having trouble with his balance. Upon urging from family and friends, Rendell went to see Stern, who diagnosed him. At first he was "stunned" and "scared" by the diagnosis, Rendell said. But he began a program of medicine and physical therapy that he continues today, and he sounded optimistic Monday. "The good news is, I can say... my disease has stabilized," Rendell said at a news conference at Pennsylvania Hospital. "Progression has, in many ways, stopped. Some of the symptoms I was undergoing are better now then they were 3 1/2 years ago." Parkinson's is a degenerative disease affecting the brain, particularly the brain cells controlling movement. Besides tremors, it can cause rigid, halting walking, slowed speech and, sometimes, dementia. Symptoms can be managed, but they worsen over time and there is no cure. Rendell is familiar with Parkinson's; his mother had the disease for the last 13 years of her life. Rendell hopes his own story helps others seek diagnosis and treatment upon the first potential signs of the disease. "The reason that we are going public today... is because I want to send a message to people from our area that if they have some of the same symptoms and are too afraid, to go ahead and get diagnosed," Rendell said. "The key in this is to get in early. I don't think if I would have waited that I would have had as good results as I've had today." 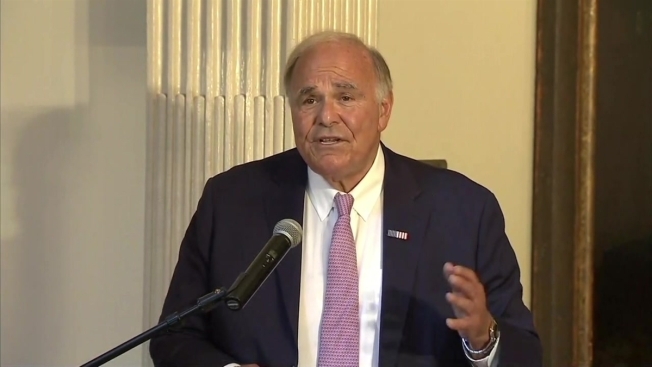 Rendell said he has received no special treatment as a former governor and that anyone with health insurance can receive the same treatment he is receiving. "Look it's not a death sentence... it doesn't have to affect the quality of your life," Rendell said, as he mentioned his busy travel schedule. Rendell moved noticeably slowly as he approached the podium to make remarks Monday. His wry sense of humor, however, remained as quick as ever. "That did sound eerily like a eulogy," Rendell joked after being introduced by University of Pennsylvania president Amy Gutmann. Rendell has been a fixture in Philadelphia politics since the late 1970s, when he became the city’s district attorney at just 33 years old. He went on to serve two terms as mayor in the 1990s, including rescuing the city's finances from near-bankruptcy. He gained a reputation as a frankly spoken chief executive who was also the city's number-one cheerleader, leading a tourism rebirth and cannonballing into city pools on opening day. Rendell then served two terms as Pennsylvania's governor in the 2000s. He also chaired the Democratic National Committee from 1999 to 2001. Rendell, who grew up in New York City, came to Philadelphia to attend the University of Pennsylvania in the 1960s. He later received a law degree from Villanova University and served as a reservist in the U.S. Army. Rendell is an outspoken critic of President Donald Trump. He's also a strong supporter of Philadelphia sports teams, and has been part of Eagles post-game coverage on NBC Sports Philadelphia. He has even claimed to have been among the Eagles fans who booed Santa Claus at a 1968 game. After the news, Rendell received messages of support from local and state politicians. "Ed should know that the entire commonwealth is standing behind him and hoping for the continued success of his treatment and therapy," Democratic Pennsylvania Gov. Tom Wolf said. "As he always has, he is putting others first by going public with his diagnosis so others can also get the help they need. We are proud of everything Gov. Rendell did and does every day for Pennsylvania and Philadelphia." Wolf's Republican opponent in November's election, Scott Wagner, tweeted his support for Rendell. "We know that he is a fighter and wish him the best as he continues to undergo treatment." U.S. Sen. Bob Casey, D-Pennsylvania, called Rendell "one of the strongest men I know" while saying he is taking on this battle "for the people of Pennsylvania." Democratic Philadelphia Mayor Jim Kenney said he is "confident" that Rendell "will triumph against (Parkinson's) with the great determination and resolve that he has demonstrated his entire life in public service. I commend him for using his voice to create much-needed awareness about the importance of early detection in treating this complex disease."